Microsoft has just announced a set of new features coming this month to Office Lens on both the Android and iOS platforms. Going through Microsoft's announcement, we noticed that most of the new features are meant to Android users, and just one will make it to iOS. 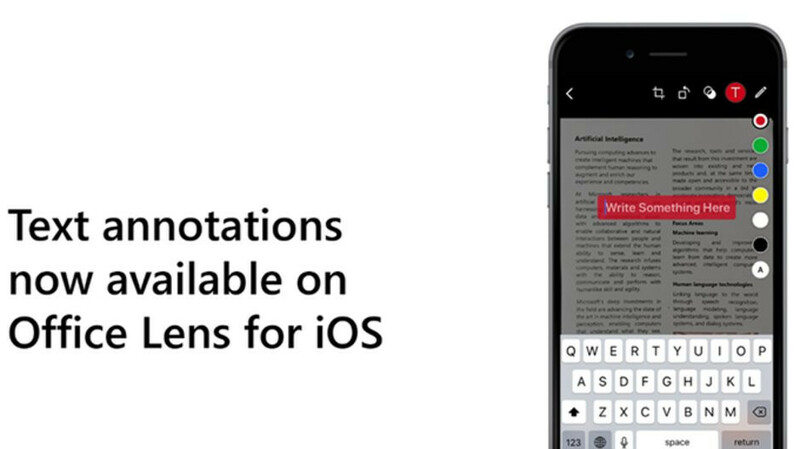 The only improvements coming to Office Lens for iOS is “text annotations,” a feature that's already available on Android for quite some time. It basically allows iOS users to annotate photos with text of different styles and colors after they've been captured with Office Lens. On the other hand, Office Lens for Android receives a brand new “immersive reader,” a features that's been available on multiple Microsoft apps across various platforms, including Windows, web, and iOS. The new immersive reader will be available for English content only and it's meant to help users easily scan and read content. The immersive reader can read out loud text captured with Office Lens while highlighting each word. Users can even control the speaking rate, increase or decrease the fonts size, as well as move backward and forward in the content. Another new feature introduced on Android is a new “tap to select” gesture. Whenever you tap the camera screen to focus, Office Lens will find the document boundary around the tapped area to lock it. Last but not least, “Snap to Edge” makes it easier for Office Lens users to remove the background from documents easier than ever. Simply move the crop handles and the cropping boundary will snap to the nearest document edge.